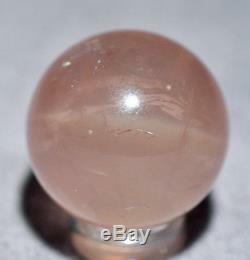 Star Rose Quartz 1.08 inch 29.4 gram Gemstone Crystal Sphere - Madagascar. All of our crystals are natural and hand selected by our store owner, a 30 year GIA Graduate Gemologist. Crystalarium - True Gifts of the Earth. 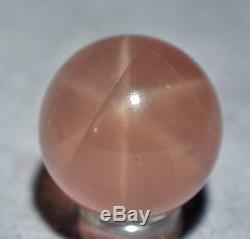 A brilliant, six-rayed star gleams upon the surface of rich pink Rose Quartz gemstone crystal sphere, with semi-translucent crystal structure and gorgeous internal wisps and veils. A stunning addition to any collection! 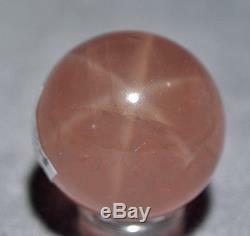 The item "Star Rose Quartz 1.08 inch 29.4 gram Gemstone Crystal Sphere Madagascar" is in sale since Sunday, December 04, 2016. This item is in the category "Collectibles\Rocks, Fossils & Minerals\Crystals & Mineral Specimens\Crystals". The seller is "crystalariumcom" and is located in West Hollywood, California. This item can be shipped worldwide.